in the process of mounting the antenna for an aretex 345 elt. i am wondering if anyone has any experience mounting this antenna base 4-5'' below the longeron and window. i am asking if that bottom 5'' of antenna behind an alum. skin will impair signal. the bottom 8 or 9'' of the antenna is encased in hard rubber. i asked a factory rep about this but it was a pretty ambigious answer. i suppose it is a pretty unpredictable set of circumstances. anyone that can speak from experience or knowledge please let me know. p.s. o.v.m. is almost in. I working a similar problem. My part number is ELT10-773 for a Kannad Compact if you want to look up a pic. 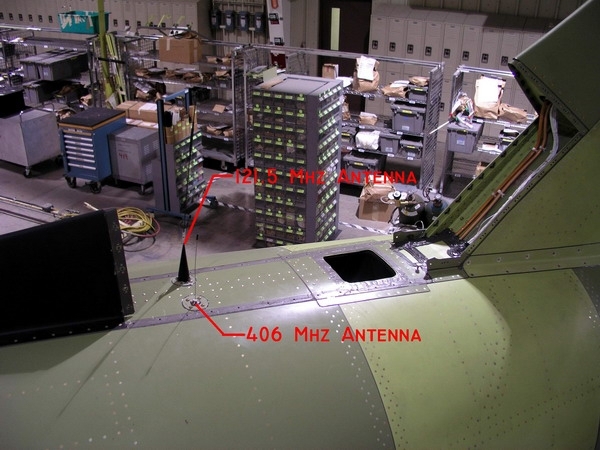 I believe these ELT whip antennas are base-loaded, meaning the Acetal plastic base is also generating signal and should not be shielded by a metal fuselage. I don’t want all that thick antenna base hanging out in the breeze. 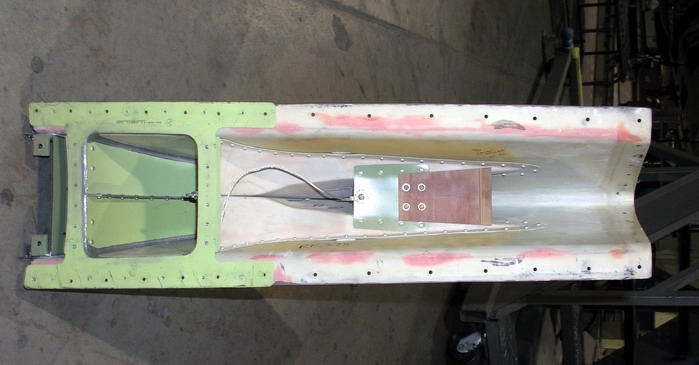 For this reason I have installed mine in the dorsal fin, but with the empennage fitted I can’t reach into the fuselage from the back to uncouple the coax BNC, so I need to make a doubler in the skin to unscrew the mount from above. This requires taking the dorsal fin off, which puts some pressure on the antenna base and causes some flex in the skin (cos it wraps around the leading edge of the horizontal stab). I would like to make a flex joint to stop the skin movement, but I suspect this antenna requires proper grounding to a ground plane just like a COM antenna. in the process of mounting the antenna for an aretex 345 elt. i am wondering if anyone has any experience mounting this antenna base 4-5' below the longeron and window. i am asking if that bottom 5' of antenna behind an alum. skin will impair signal. the bottom 8 or 9' of the antenna is encased in hard rubber. termination of the feed line. be totally enclosed under the dorsal fine toe fairing. by the non-standard installation of the stock antennas. the TSO . . .
installation are more guess than fact. Your insight and presentation is invaluable. I have seen too many builders conceal the antenna and then its effectiveness is negated. They can answer Yes the have an ELT, yes they can hear it on their radio and then if needed it is ineffective. My direct experience, both personal and as a searcher, is almost any installation anywhere will put out a signal detectable by the satellites. The rather universal exception is an external mounted antenna during a severe crash. What happens then is the antenna is sheared off and becomes worthless. So as much as anyone can predict, your installation will work better than most given the need. Good data sir . . . thanks! 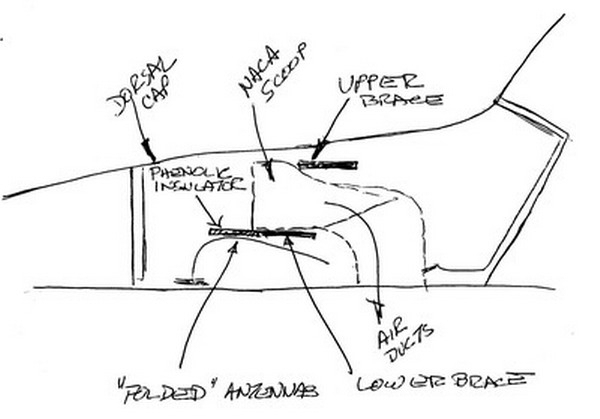 I have some interest in that top loaded antennae you depict. I mounted my whip antennae on the belly of a Zenith 601XL, in order to remove the interference that it had with my comm antennae. Well, now it almost drags the ground. Not a good thing on a grass strip. It would be nice to have a shorter antennae. With that being said, I'm firmly in the camp of not ever expecting to rely on an ELT for anyone to find me.� It's there and operating for legal compliance and nothing else. Many, if not Most crashes wind up with the plane Up-Side-Down. So top mounted antennas become buried in the dirt or broken off. When an aluminum plane is upside down there is even more of a barrier between the ELT antenna and the sky. 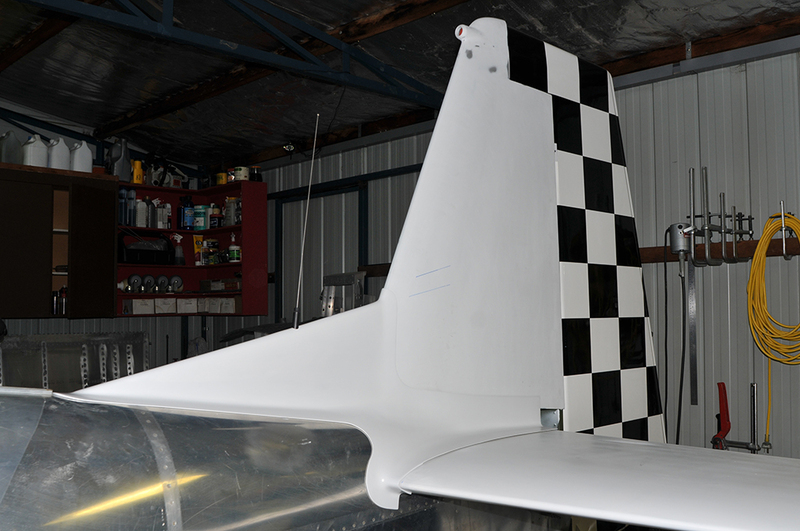 Wing Tips usually have the least amount of damage from a crash. And, they are usually the farest away from the fuel tanks, the Horz Stab wing tips being the best location. Personally I feel ELT's are one step above useless. They are usually in a fixed location, broken, buried,or have a dead battery. They are an FAA Reg, not a true safety, Search & Rescue device. Consider a Personal Around the neck, or leg mounted PLT (Personal Locating Transmitter). With that being said, I'm firmly in the camp of not ever expecting to rely on an ELT for anyone to find me. It's there and operating for legal compliance and nothing else. As stated, I agree, Barry. But, even if you have ADS-B, the FAA still makes you put that useless radio in your airplane, and they make you connect it to an antennae. My antennae practically drags the ground, and gets pulled on while picking up grass. The antennae Bob depicted looks like it would be more robust, and (being higher) wouldn't drag through the grass. Many RV builders put them inside the tail fairing, and others with tipup canopies put them on the top longeron behind the roll bar in the baggage compartment, curving up inside the rear window. If you read the mfgr's 'required' location, most type certificated light planes violate the requirements. were fitted with such direction finders . . .
reporting acquisition and loss times for signals. to a 20 mile or so circle. the early history of ELT. GPS and UHF technologies changed the ball game. a modern GPS coupled ELT is a pretty good value. I figure that my ELT is another layer of protection for keeping my passengers and me alive. I also wear seat belts... and shoulder harnesses, and I carry a small fire extinguisher... and I have a steel firewall... well... you get the idea. Given the overall cost of my airplane, the additional dollars for the ELT are pretty small. If I crash, I figure that there is a pretty good chance that my 406 MHz ELT will survive and summon assistance. With luck, we'll still be alive when help gets to us. Also, I figure that I owe this to my passengers. I'm not making the decision solely for myself. https://CheerfulCurmudgeon.com/"We do not see the world as it is. We see the world as we are." Thanks guys. It's good to know everyone is safety minded. My dad always said that if you don't have what you need, then you need what you have. An ELT is a great thing, except when compared to a host of improved technology that has replaced it. It is a last resort, but in 2018 the emphasis should be on LAST. That being said, it won't even be a last resort if the ground dragging antennae has been ripped off by the grass at a poorly kept strip. My question concerning the T shaped antennae is a possible effort to improve the viability of my ELT as a safety device. Is there a reference you could refer a person with a goal of building one to for that type of antennae? AWESOME - BOB, AWESOME! I was USAF radio maintenance in Korea with the 19th Task Force and did a little flying in O-2's up at the DMZ. Don't know if this is something that concerns you, but the antenna is part of the elt's certification. Obviously any comm antenna will work (for the old 121.5 models), but they won't be 'legal'. The new '406' units are a different story; I'm pretty sure that they are dual freq transmitters, needing an antenna that can handle both 406 and 121.5. Art, your thinking is correct. To say modern 406 ELTs are no good is astatement that cannot be rationally justified. The fact is, they are fantastic devices. a PLB. I certainly do. Just last month a buddy wrecked his airplane (he was unhurt). might have saved lives by completely eliminating the search portion of SAR. 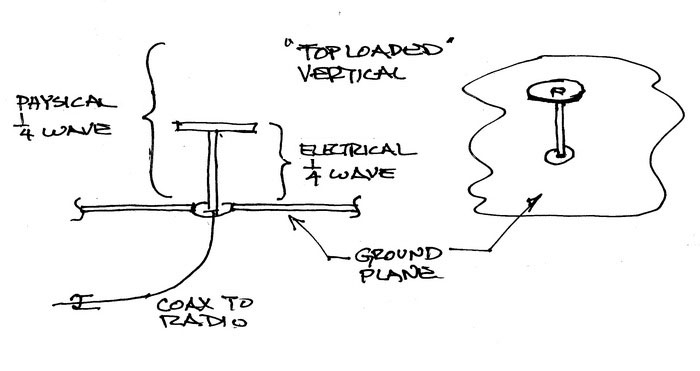 Could you confirm please that the threaded metal mount of a base-loaded 406MHz ELT antenna should definitely have some ground plane like a COM antenna? Pictured below is my current installation and the ELT antenna, but I need to add some flexibility to the attach point in a small space on the upper surface of the fuselage without compromising grounding (I think). 1. 121.5MHz satellite COSPAS/SARSAT reception (payloads piggy backed on NOAA satellites, among others) primarily used doppler shift (frequency change, much like the sound of a train approaching, passing and leaving you) to determine the abeam point (centre frequency) during each satellite pass. Unfortunately, there is an abeam on both sides of the satellite path, so multiple passes were required to resolve the fix ambiguity. While there were lots of satellites fitted with this payload, it could still take as long as 12 hours to achieve multiple passes and a decent search datum to launch SAR assets to. In fact, when a C-130 crash position indicator was popped off the tail around Cootamundra (near Canberra, Australia), it still took nine hours for COSPAS/SARSAT to provide a start datum, despite knowing where to look. 2. 121.5MHz beacon frequency stability was relatively poor, meaning establishing centre frequency was inaccurate and the possible datum ellipse was commensurately large (not so great for limited SAR resources). 3. The approximate 121.5MHz position was then used to for local Direction Finding via other platforms. 4. The COSPAS/SARSAT network was highly susceptible to false alarms triggered by stray RF. Approximately 95% of alerts were false the world over, meaning already resource limited SAR assets were being wasted and potentially denying people in real need. 1. 406MHz signals are digital and it incorporate a unique HEXID, which is 15 digits long. It can be appended with all sorts of information in a long or short message format. Geostationary satellites can collect this information and the Rescue Coordination Centre immediately knows (from the registration database) whose ELT is active. Form the database they can obtain your contact details and call you or your nominated alternative points of contact. 2. If your 406 ELT doesn’t have a GPS input (either an inbuilt GPS receiver, or GPS feed signal from the NAV system onboard your aircraft), then Low Earth Orbit (LEO) satellite passes still take time to conduct doppler analysis for position. However, the frequency stability of modern 406.025MHz ELTs provides a much smaller ellipse of about 5km. 406 beacons must still have a 121.5 swept tone signal for localised rescue platforms to direction find, but that the COSPAS/SARSAT detection of 121.5 was switched off back in Feb 2009. 3. If your 406 ELT does have a GPS input (highly recommended option), then the position is appended to the long message digital broadcast and is received by the RCC as soon as a valid GPS fix is obtained … obviously a much better option! I have a non-GPS Kannad Compact ELT connected to this antenna, which has frangible switches to activate automatically in a crash. I also have a GPS PLB, which I can activate if I am still alive or become separated from the aircraft (such as after ditching perhaps). Small price to pay for a lot of assurance that rescuers know where to start looking and when. Exposure is the big killer (assuming injuries are survivable) and often the first 24 hours are the only 24 hours to rescue before it’s too late, so it’s in our best interests to start the search and rescue in the right place. GPS and UHF technologies changed the ball game. Now, the ELT can REPORT your position to an accuracy of a few feet. Moreover, the ability of a UHF signal to propagate from unfriendly environs is better. Combine this with improvements in communications technologies and protocols, the probability of success for transmitting and ELT signal are improved by orders of magnitude both in terms of location and shortening response time. If you fly a lot over ugly/remote terrain, a modern GPS coupled ELT is a pretty good value. -- https://CheerfulCurmudgeon.com/"We do not see the world as it is. We see the world as we are." to meet the performance criteria of the TSO, not the letter of it. could have just as easily said a 121.5 antenna with less than x.yy SWR. (for the old 121.5 models), but they won't be 'legal'. but in 2018 the emphasis should be on LAST. effort to improve the viability of my ELT as a safety device. building one to for that type of antennae? of my airplane, the additional dollars for the ELT are pretty small. be alive when help gets to us. though they are the same freq. for same purpose and probably very close in SWR." Yea! Don't ya just love it... When Lawyers become EE's!!! I had that exact problem with a 337. Except the ELT Antenna was supplied by the aircraft manufacture. Manufacture - trumps - Supplier. > (for the old 121.5 models), but they won't be 'legal'. > but in 2018 the emphasis should be on LAST. > effort to improve the viability of my ELT as a safety device. > building one to for that type of antennae? > of my airplane, the additional dollars for the ELT are pretty small. > be alive when help gets to us. > decision solely for myself. > GPS and UHF technologies changed the ball game. > a modern GPS coupled ELT is a pretty good value. For sure many aircraft finish upside down after a sudden stop … the 400lb engine up front of my tailwheel aircraft will almost guarantee that. However, I've installed the whip antenna just forward of the vertical stab where it should be reasonably protected from a tip over. I have reviewed numerous RV and Rocket wrecks and think my ELT installation has a pretty good chance of remaining operational, provided I mount the coax with sufficient slack and flexibility to withstand a buckling fuselage. Even an inverted whip is correctly oriented for low altitude (i.e. closer to the horizon) satellites to receive from a ‘donut’ radiation pattern. And, no matter which Local User Terminal around the world receives the signal, the position will still be re-routed to the correct RCC for SAR response in near real time. The 406MHz data burst is .45 to .55 seconds long at 5W and randomised around 100 second intervals, so it has a good chance of being received and relayed by at least one satellite. I don’t mean to preach and there are a great many wise people on this forum, but respectfully, from a Search and Rescue Officer's point of view, I couldn't disagree more with those who think an ELT is a waste of time and money. Years of SAR missions as a P3 Orion Tactical Coordinator for the Australian RCC, plus many more years as an Operations Officer, then SAR Officer and SAR instructor have proven time and time again to me the value of ELTs, especially 406 with embedded GPS. Crashed aircraft are incredibly difficult to see from the air when moving at between 2 and 4 nautical miles a minute. Yes ADS-B is a great starting datum for ATC & SAR, but if, for example, you have an electrical issue late one afternoon that stops ADS-B output (smoke and fumes or inflight fire that requires load shedding) and becomes a crash situation, just a few minutes of cruising off flight plan can easily delay location and rescue way past your overnight survival time. I can tell you from first hand experience in the RCC that it is very distressing for rescuers to miss you by just a few hundred feet or a few hours. It is even worse for the family left behind to realise that you might have been alive long enough to rescue if we had known exactly where to look. In fact, a former Senior Naval Officer at our School of Air Navigation lost his son in a light aircraft crash. A small piece of media misinformation meant a critical piece of search intelligence was overlooked. 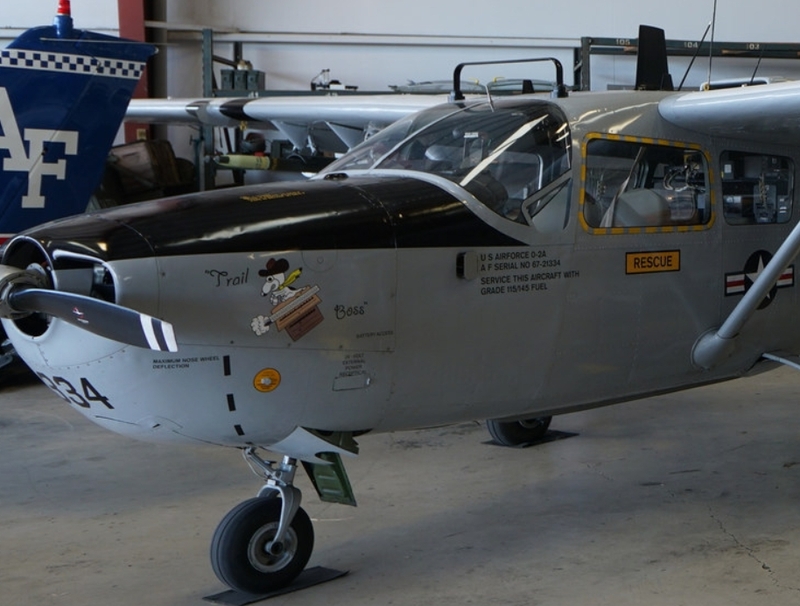 The pilot and passenger were located some months later in a follow-on search funded by the father, only to find that his son had survived with a broken leg for what was believed to be a week after the crash before succumbing to exposure. It’s a morbid subject, but aviation is intolerant of fools and as aviators we need to be properly trained, equipped and prepared. The mandate is there for good reason, so we should install the ELT correctly, register and maintain it … it’s definitely not worth risking your life to neglect the ELT / PLB. And, carry a jumper The priorities of survival are Protection (from the elements), Location (signalling devices, fires etc), Water, Food … in that order. We can survive for three days without water and 30 days without food, but who would want to do that? I’d rather get outta there.